Despite what many people think, St. Louis is a city of immigrants. If you stroll down South Grand Avenue, you can see people from all over the world including Vietnam, Nigeria, and Bosnia. In fact, St. Louis has the largest Bosnian population in the country and most of the Bosnians came to St. Louis as refugees during the war in the 1997. 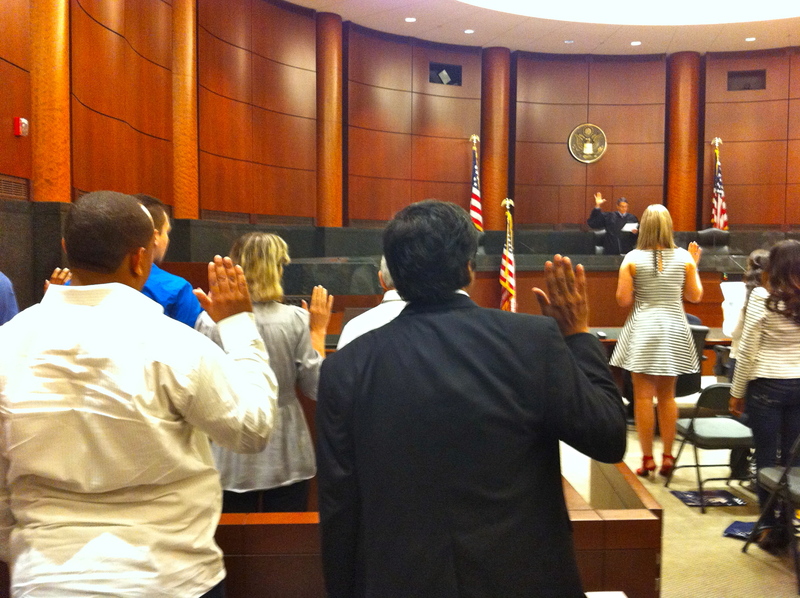 A naturalization ceremony is where someone becomes a citizen of the United States. They occur on most Fridays all year in the Eagleton Courthouse downtown. In order to become a citizen of the United States through naturalization, you must be a resident for at least 5 years, passed a test on US government and culture, and passed an interview with a naturalization officer. The ceremony began in a courtroom on the 26th floor. The courtroom was full with about 45 soon-to-be citizens sitting in the front and friends and family sitting behind them. The judge then entered the courtroom and introduced the Dean of St. Louis University Law School to speak. After the speech, the district attorney filed a motion to allow the 51 people to become citizens and asked each person to introduce themselves and tell their story. This was my favorite part of the day because each person had an incredible journey to make it to their naturalization ceremony. The 51 represented over 20 nationalities. Bosnia and India were the best represented, but there were also people from Uzbekistan, Afghanistan, China, the Netherlands, South Korea and the UK. Interestingly, there was nobody from Latin America. Although citizenship can be obtained after having a green card for 5 years, everyone in the room has lived in the United States for at least 12 years because of the difficulty of the test, obtaining the green card, and the English language proficiency requirement for the interview. After the introductions, the judge led the soon-to-be-citizens in the Oath of Allegiance, which is the oath one takes to become a citizen. After the Oath, a security guard in the courthouse sang the Star Spangled Banner. For the first time in these people’s lives, this song was now their national anthem and many people in the courtroom, including myself, started to cry. After the national anthem, each new citizen received a flag and certificate from the judge. The amazing view from the top floor of the Eagleton Courthouse. The fountain in Illinois is the Gateway Geyser, the world’s second highest fountain. 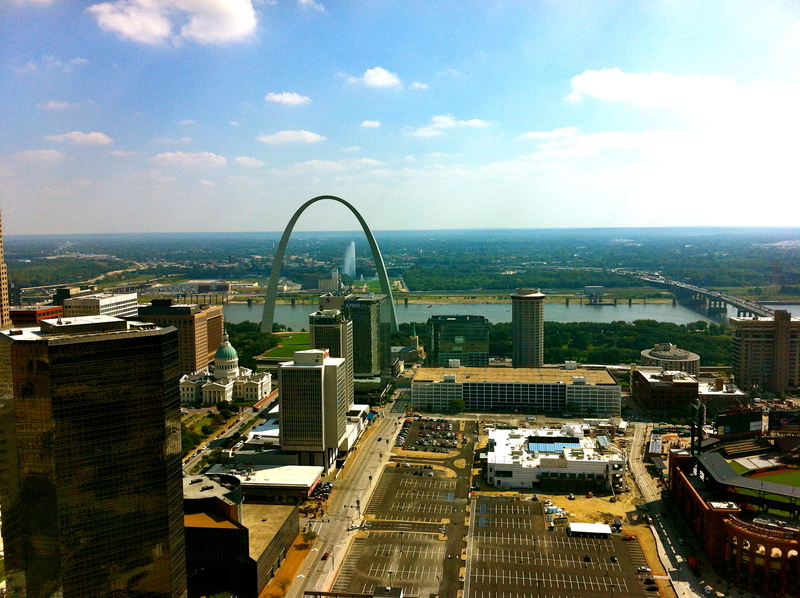 The courtroom on the 27th floor was deliberately picked because when you walk out, you are struck with a postcard-perfect view of St. Louis: the Arch and Busch Stadium. Everyone who left the courtroom was probably thinking something along the lines of “this is now my country” when staring over all of St. Louis. I think that everyone should attend a naturalization ceremony because it makes you appreciate your citizenship and allows you to see America as a melting pot firsthand. Oftentimes, people overlook immigrants and people with foreign accents. This day made me realize their hard work and struggles that go unnoticed. Just because someone is foreign-born does not mean that they are any less American than someone born here. This ceremony made me proud to live in such a diverse country.